A few weeks back I flew into Ballina. Gateway to the profoundly beautiful and delusional. On the plane were the usual faded flowers and tatted pretend-me-nots mixed in with the odd whiffy backpacker. So far so good. I was uptraded into a gold nondescript vehicle with a faulty rear view mirror that occasionally dropped onto the floor. So far so good. I then popped around the corner to the Aldi store to get a few vittles to chew on in the hinterland. Most items purchased were subsequently found to be quite good – the cheese in particular but I should have examined the entrails a bit more closely in the produce section. The sad wilted stuff reminded me of a fruiter in Newtown before the sharp set moved in. I called him Kevin – “Fruiterer to the Disappointed”. Passing by to grab a caffeine needle you’d see the saddest carrots and lettuce imaginable. I suppose it’s good to know Kev is advising Aldi these days. 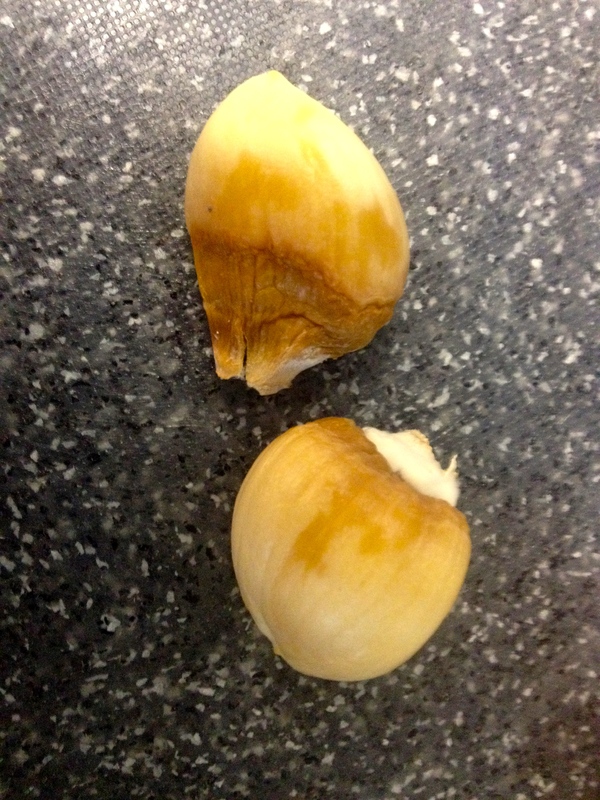 I reluctantly grabbed a knob of garlic that appeared reasonable. Later that evening when preparing a meal I discovered that every clove was old, rotten crap. Bloody Germans. I was disappointed. But moved on. That is until I happened to be driving through one of the hinterland hamlets of Clunes. Everything was pretty perfect until that moment. I was tuned into Paradise FM. The song playing at the time was “That’s when I think of you” by the Australian band ‘1927’. And that’s when I found myself behind an Aldi truck. It all began to come together. Was this a sign? Was the band name a clue to the year the German firm grew their garlic. Had it been stored in some underground bunker since that time? 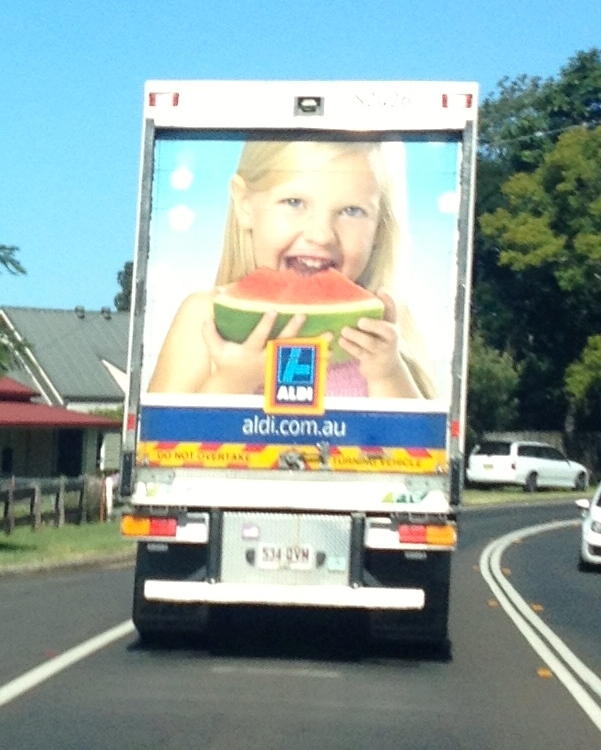 But it was the picture on the back of the German truck of a blond-haired blue-eyed girl filling her fat little gob with a large slice of watermelon and smiling …no mean feat…that really got me. Yeah man it really got me going. So on my return to the pointy end of Balmain I took a shiraz sedative and penned an email to Aldi with a few shots I’d taken for a bit of colour. I understand that you are a German company allegedly synonymous with efficiency and quality. Well chaps I can see why the Germans lost two wars given my profoundly disappointing experiencing on the 11 May 2015. The 11th May strangely enough was my birthday – yes I am an older citizen of this country as you can obviously deduct from the fact that I referenced the war and I’m wasting what is left of my diminishing life writing to you over 82 cents worth of your awful garlic. 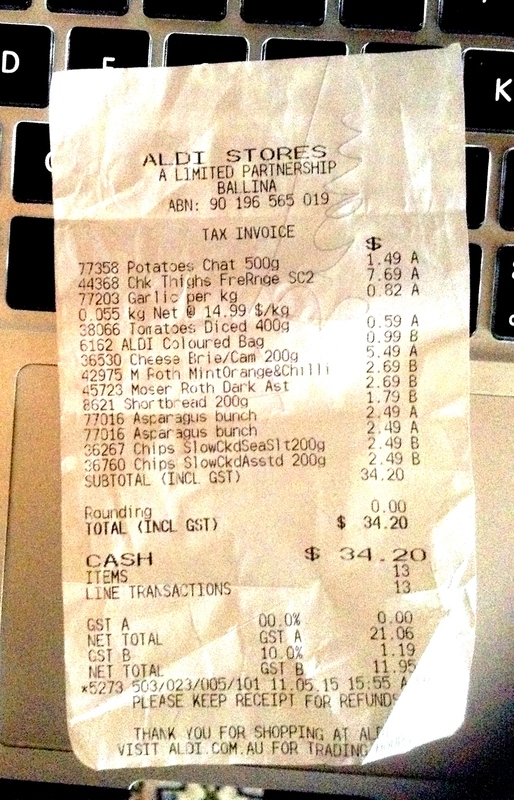 So to continue, I went to your Ballina store (on my birthday) and bought some garlic (see photo and receipt attached). As you can see the garlic was reminiscent of the rotten teeth of someone who was either on ice or was dug up out of an Irish bog pit. What do I want from you Mr Aldi? Well not much really as I know full well pessimists never get disappointed. But I will stake my claim quite simply. 1. I want you to stop selling sub-standard produce and I would like you to tell me how you are going to do this? 2. And I want an appropriate gift voucher (it was my birthday after all) to compensate for the fact that I couldn’t cook one of my very special signature dishes that evening (a chicken & tomato dish in case you may be vaguely interested) due to your sub-standard produce. They’ve got four days to get back to me according to their very efficient website. I’m biding my time. I’ve got my army disposal camouflage pants on. I’m ready for whatever the German firm wants to throw at me and I’m particularly comforted by the fact that we’re already two zip up against them.